Just as in any setting, lighting can alter and change the mood of a situation. Changing you car or truck lights using a HID conversion kit can help restore your cars cool looks and enhance the night-time driving with its bright lights. When you take the plunge into the world of high intensity discharge headlamps, you are protecting your car, saving energy and having four times better night-time visibility over halogen bulbs. Having these bulbs makes it safer and allows you to be seen easier. As they are generally used for off-road purposes, you can navigate your way through dark areas, such as forests, more easily. 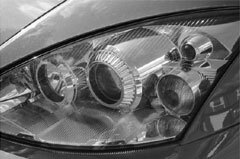 Not only are they safe, but HID headlights help transform the aesthetic appeal of your car. The different heat which the bulbs burn at creates a different light emitted from the bulb. The lowest temperature is around 4300K (degrees Kelvin) and it is very white. The higher the temperature goes, up to a maximum of around 12000K, gives off a blue/purple color. This is a very unique but acquired taste. It may not be for everyone, which can also be a benefit so you can have a very unique and cool looking car. Many people stick to bulbs which are around the 5000K-8000K mark and as a result are the purest white or have a slightly blue tinge. Both of which light up the dark night time very easily. Having a choice of the color of your headlights is a luxury which even just a few years ago you would never think it would be possible. This gives you flexibility and allows you to customize and make you car a very individual one. This is the height of where car accessories are going. It’s a subtle change but one which has a great impact. « More information on Tour De France?